"Problem Gambling" is a colloquial term and is medically known as "pathological gambling" ("Pathological Gambling"). 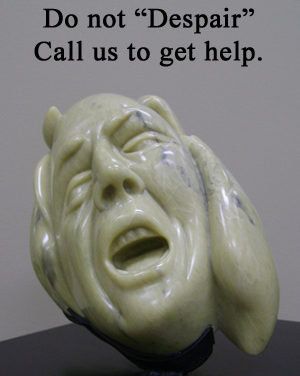 Pathological Gambling afflicts hundreds of thousands of Ontarians. The number of people dying from fatal car accidents is vastly less. Like fatal car accidents, the consequences of Pathological Gambling include family destruction, suicide, bankruptcy, and other tragedies but is nonetheless burdened with false stereotypes. The Province of Ontario who runs gambling and lottery schemes through its agent the Ontario Lottery and Gaming Corporation (“OLG”), is well aware of the severe nature and consequences of the Pathological Gambling. One key study demonstrated that about 35% of OLG’s gambling revenues are extracted from Pathological Gamblers. 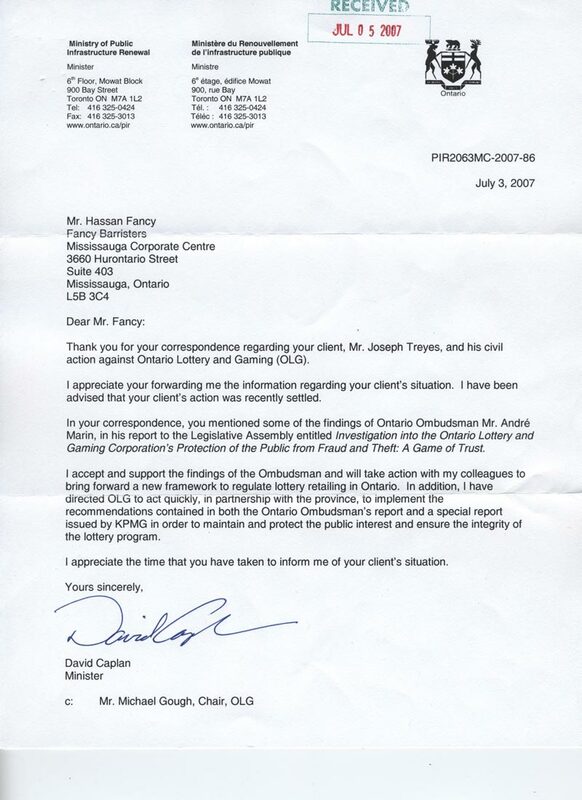 "In this agreement OLGC contracted to use its best efforts to deny Mr. Treyes entry to all of OLGC's gaming venues in the province of Ontario. Contrary to the agreement Mr. Treyes was permitted access to Woodbine and Mohawk where he sustained the losses claimed in the Statement of Claim dated May 26, 2005." See the full decision: Treyes v. OLGC  O.J. No. 2722. Therefore, for the next year we worked hard on gathering evidence, researching the law, and signing up clients to improve Canada with a globally unprecedented Class Action for $3.5 billion against the OLGC. 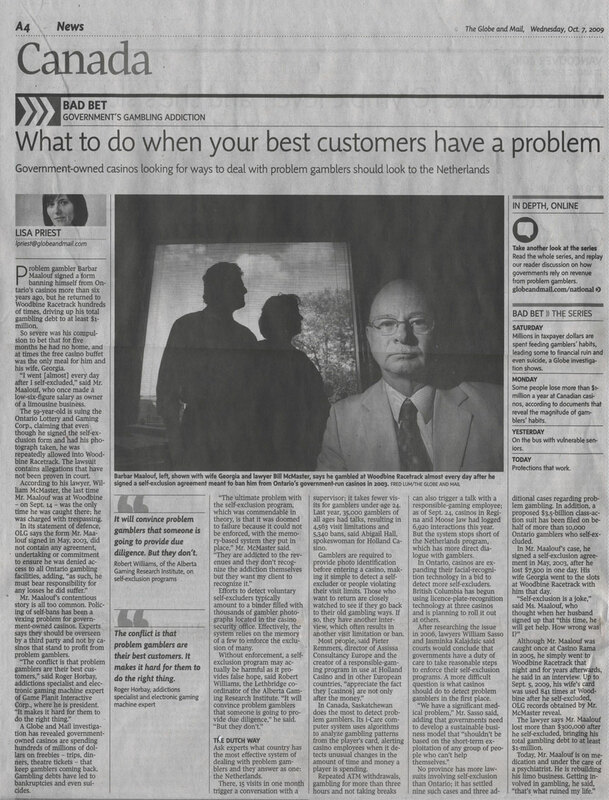 Read "What to do When Your Best Customers Have a Problem" from the Globe and Mail's story dated October 7, 2009. Read here. 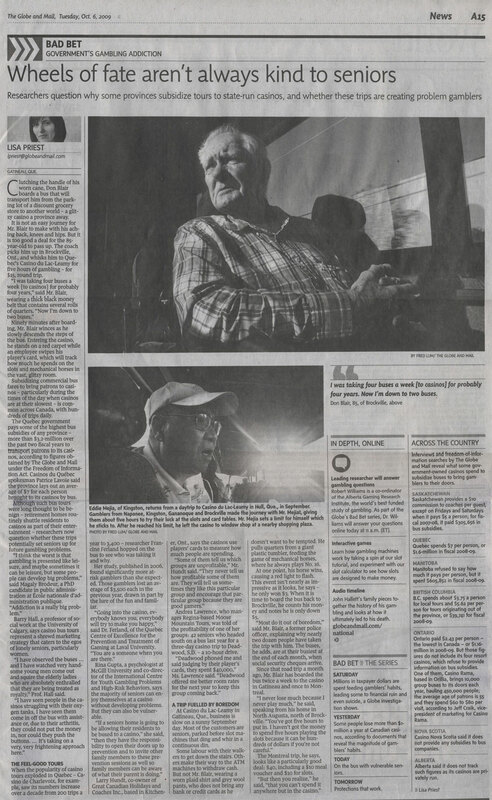 Read "Wheels of Fate Aren't Always Kind to Seniors" from the Globe and Mail's story dated October 6, 2009. Read here. 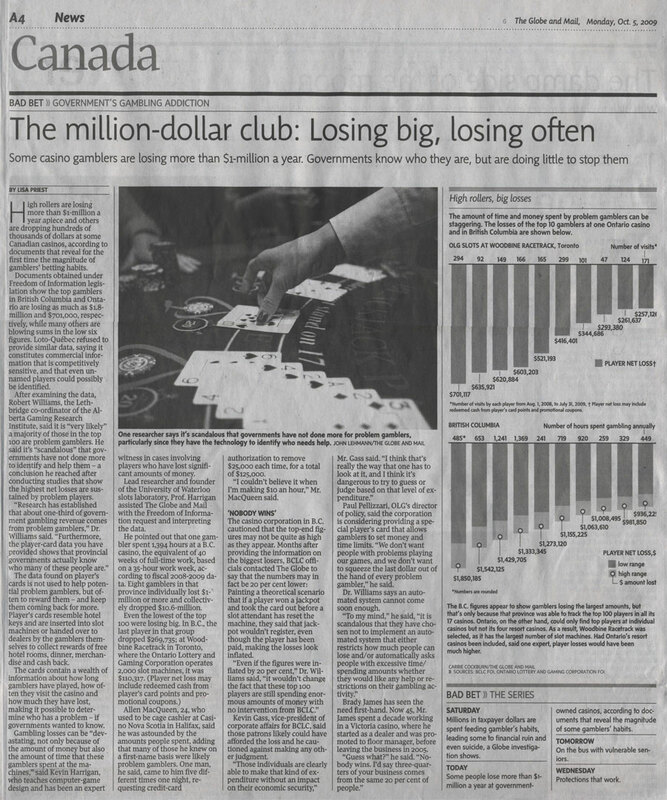 Read "The Million-dollor Club: Losing Big, Losing Often" from the Globe and Mail's story dated October 5, 2009. Read here. Read "Casinos Spend Millions to Make Losers Feel Like Winners" from the Globe and Mail's story dated October 3, 2009. Read here. Read "A Family Man's Tragic Transformation" from the Globe and Mail's story dated October 3, 2009. Read here. Read "OLG chief: I'm the scapegoat" from the Toronto Star's story dated September 16, 2009. Read here. 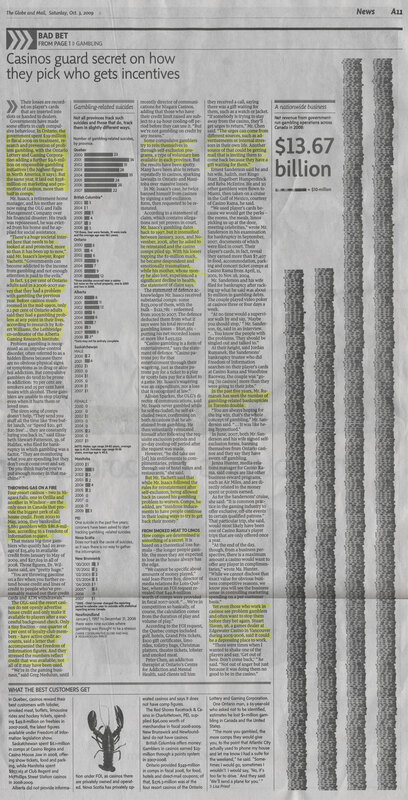 Read "Rethink Crown Agencies" from the Toronto Star's story dated September 5, 2009. Read here. Read "Casino Contracts under Fire" from the Toronto Star's story dated September 2, 2009. Read here. Read "Ontario Cleans House at OLG" from the Globe and mail's story dated September 1, 2009. Read here. Read "Culture of Scandalous Spending" from the Globe and mail's story dated September 1, 2009. Read here. 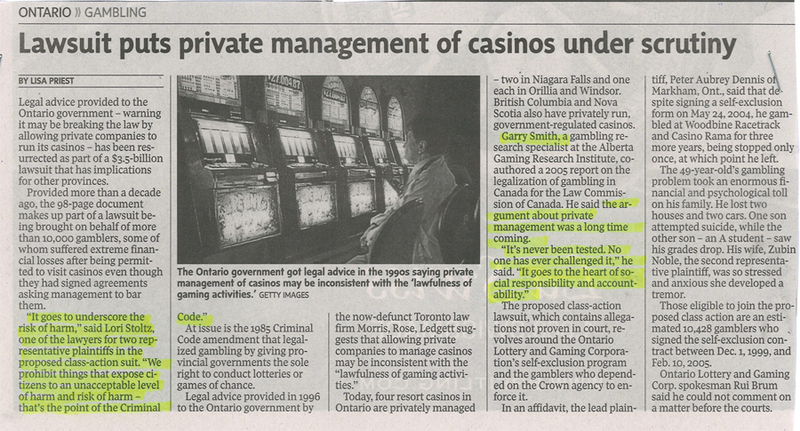 Read "Lawsuit Puts Private Management of Casinos Under Scrutiny" from the Globe and mail's story dated May 18, 2009. Read here. Read "Problem Gamblers Play Losing Hand" from Winnipeg Free Press's story dated April 22, 2009. Read here. 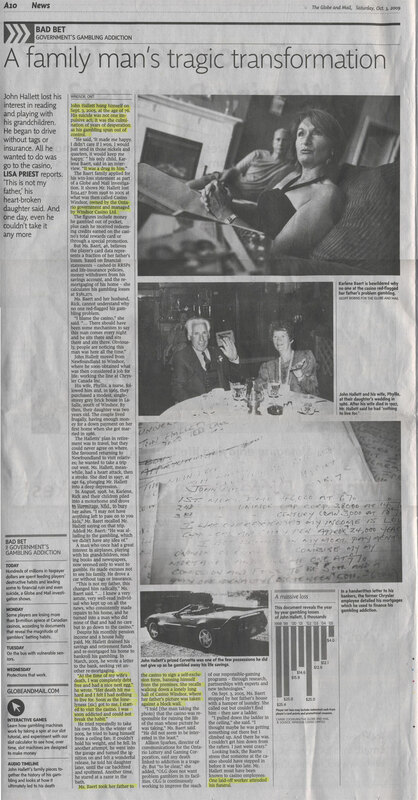 Read "The Big Bluff" from the Globe and mail's story dated April 18, 2009. Read here. Read "Ont. Man Sues Lottery Corp." from The Star Phoenix's story dated April 9, 2009. Read here. See CITY TV interview with Hassan Fancy on April 8, 2009. Watch here. See Mr. Fancy's interview on March 28, 2009 on CTV by Paula Todd of W-FIVE. Watch here. See Mr. Fancy's interview on June 11, 2008 - 12:00 noon by the CBC on the Class Action. See Mr. Fancy's interview on June 11, 2008 - 6:00 p.m. by the CBC on the Class Action. The Niagara Falls Review, Article on the "Problem Gamblers Class Action" dated June 13, 2008. Read here. Sault News, Article on "Ontario’s Problem Gamblers Launch Class Action Suit" dated June 24, 2008. Read here. Letter from Fancy Barrister P.C. to Honourable Mr. Caplan on March 29, 2007. Read Here. Letter from Honourable Mr. David Caplan to Fancy Barristers P.C. on July 3, 2007. Read Here. Letter from Fancy Barristers P.C. to Honourable Mr. Caplan on July 9, 2007. Re: Ontario Lottery & Gaming ("OLG"). Responsible Gaming: Self-Exclusion Read Here. Letter from Honourable Mr. David Caplan to Fancy Barristers P.C. on August 31, 2007 Read Here. Letter from Fancy Barristers P.C. to Honourable Mr. Caplan on Oct 5, 2007. Re: Ontario Lottery & Gaming ("OLG"). Responsible Gaming: Self-Exclusion. Read Here.